SQL Server 2008 introduces a new column attribute that is used to reduce the storage consumed by NULL values in the database tables. This feature is known as Sparse Columns. Sparse Columns work effectively in the case of the columns with high proportion of NULL values, as SQL Server will not consume any space storing the NULL values at all, which helps in optimizing the SQL storage usage. A trade-off when using the Sparse Columns is the additional 4 bytes space required to store the non-NULL values in the Sparse Columns. So, it is recommended not to use the Sparse Columns unless the column has a high percentage of NULL values in it, in order to gain the storage saving benefits of the Sparse Column feature. When you store a NULL value in a fixed-length column such as a column with INT data type, the NULL value will consume the whole column length. But if you store that NULL value in a variable-length column such as a column with VARCHAR data type, it will consume only two bytes from the column’s length. Using Sparse Columns, NULL value will not consume any space regardless of using fixed-length or variable-length columns. But as mentioned previously, the trade-off here is the additional 4 bytes when storing non-NULL values in the Sparse Column. For example, a column with BIGINT datatype consumes 8 bytes when storing actual or NULL values in it. Defining that BIGINT column as Sparse Column, it will consume 0 bytes storing NULL values, but 12 bytes storing non-NULL values in it. The reason why NULL values in the Sparse Columns consume 0 bytes and the non-NULL values consumes extra 4 bytes is that the Sparse Column values will not be stored with the normal columns, instead it is stored in a special structure at the end of each row, with 2 bytes to store the non-NULL values IDs and 2 bytes to store the non-NULL values offsets. This complex structure results in extra overhead too to retrieve the non-NULL values from the Sparse Columns. Enjoying the storage optimization benefits of the Sparse Columns depends on the datatype of that Sparse Column. For example, the NULL values percentage of a column with BIGINT or DATETIME datatypes should not be less than 52% of the overall column values to take benefits of the Sparse Columns space saving, and should not be less than 64% for the INT datatype. On the other hand, 98% NULL values from a column with BIT datatype will allow you to take benefits of the Sparse Column storage optimization. Sparse Columns can be defined easily by adding the SPARSE keyword beside the column’s definition. The NULL keyword in the Sparse Column definition is optional, as the Sparse Column must allow NULL values. As a result, Sparse Columns can’t be configured as Primary Key, IDENTITY or ROWGUIDCOL columns. You should take into consideration when you define a Sparse Column that you can’t assign the default value for the Sparse Column. Also, Computed columns can’t be defined as Sparse Columns. The text, ntext, image, vbinary(max) , geometry, geography, timestamp and user-defined datatypes can’t be used for the Sparse Columns. Sparse columns don’t support also data compression. The previous shocking numbers meet what we mentioned previously, that the non-NULL values on the Sparse Columns will consume extra 4 bytes for each value, resulting more space consumption. As you can see from the previous result, we will take benefits of defining the Emp_Last_Name and Emp_Email columns as Sparse Columns, as the Null Values percentage is over or equal to 60%. Defining the Emp_Address column as Sparse Column is not the correct decision here. SQL Server Filtered Non-Clustered Indexes can be used with the Sparse Columns in order to enhance the queries performance in addition to the space saving gain from the Sparse Columns. With the Sparse Column, the filtered index will be smaller and faster than the normal non-clustered index, as it will store only the data that meets the criteria specified in the WHERE clause of the index definition. You can easily exclude the NULL values in the filtered index to make the index smaller and more efficient. SQL Server provides you with a way to combine all the Sparse Columns in your table and return it in an untyped XML representation, this new feature is called the Column Set. 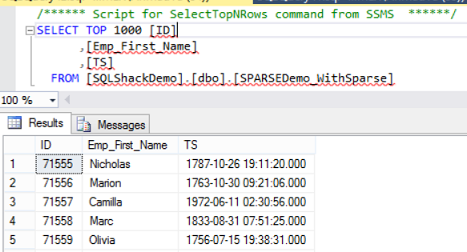 The Column Set concept is similar to the computed column concept, where SQL Server will gather all Sparse Columns in your table into a new column that is not physically stored in the table, with the ability to retrieve and update it directly from that new column. And you still able to access these Sparse Columns individually by providing the column name. This feature is useful when you have a large number of Sparse Columns in your table, which allows you to operate on these set of columns in one shot, as working on it individually is very difficult. Column Set can be defined by adding the COLUMN_SET FOR ALL_SPARSE_COLUMNS keywords when creating or altering your table. The Column Set can be specified in the definition of the table that contains Sparse Columns which will appear directly, or to a table without any Sparse Column, where it will appear once you add these Sparse Columns. Take into consideration that you can define only one Column Set per each table, and once this Column Set is created, it can’t be changed unless you drop the Sparse Columns and Column Set or the table and create it again. The Column Set can’t be used in Replication, Distributed Queries, and CDC features. Also, you can’t index the Column Set. The Column Set overrides the maximum number of Sparse Columns per each table, which is 1024 columns for each table. The Column Set can contain up to 30,000 Sparse Columns in your table. However, no more than 1024 columns can be returned in the result set at the same time and in the XML Column Set result. Sparse Column is a very efficient feature that can be used to store NULL values in a database table with a high NULL values percentage. Combining it with the filtered indexes will result in a performance enhancement to your queries and smaller non-clustered indexes. Together with the Column Set, Sparse Columns can be retrieved and modified in one shot, displayed in XML format and extends the number of columns per table limitation. Be careful when you use these features; as it is a double-edged sword; if you test it well and make sure that it will suit your case, you will get the best performance, otherwise it may cause performance degradation and consume your storage.